You may have noticed the unusual cover for this record. 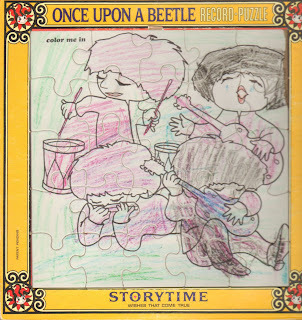 Apparently the original cover was a puzzle in the surrounding frame, and under that you could color the picture. Well, the copy I got didn't have the puzzle pieces in it any more, and the picture had been colored so long ago I couldn't get the colors off! Anyway, hope you like this album! Your blog is ridiculous. How old are you? Why don't you shut up. This is great music I am 27 and listen to it all the time. It is better than that rap garbage on the gadio today. I got this record for my fourth birthday in 1967 at HiWay Market in Kitchener Ontario, along with The Monkees Headquarters album. I was just digging through my old records and found this album again. No puzzle pieces and I had coloured the sleeve as well. Thanks so much for the mp3's! Haven't heard it in over 40 years and I remembered the intro music immediately.